In late November and early December, a hospital in western Florida started to see a spike in the number of cases of acute gastroenteritis-like symptoms. Patients began arriving at the emergency department complaining of excessive bouts of emesis (vomiting) and diarrhea (with no blood in the stool). They also complained of abdominal pain and cramping, and most were severely dehydrated. Alarmed by the number of cases, hospital staff made some calls and learned that other regional hospitals were also seeing 10 to 20 similar cases per day. What are some possible causes of this outbreak? In what ways could these cases be linked, and how could any suspected links be confirmed? We’ll return to this example later on this page. The field of epidemiology concerns the geographical distribution and timing of infectious disease occurrences and how they are transmitted and maintained in nature, with the goal of recognizing and controlling outbreaks. The science of epidemiology includes etiology (the study of the causes of disease) and investigation of disease transmission (mechanisms by which a disease is spread). Epidemiological analyses are always carried out with reference to a population, which is the group of individuals that are at risk for the disease or condition. The population can be defined geographically, but if only a portion of the individuals in that area are susceptible, additional criteria may be required. Susceptible individuals may be defined by particular behaviors, such as intravenous drug use, owning particular pets, or membership in an institution, such as a college. Being able to define the population is important because most measures of interest in epidemiology are made with reference to the size of the population. The state of being diseased is called morbidity. Morbidity in a population can be expressed in a few different ways. Morbidity or total morbidity is expressed in numbers of individuals without reference to the size of the population. The morbidity rate can be expressed as the number of diseased individuals out of a standard number of individuals in the population, such as 100,000, or as a percent of the population. Figure 1. 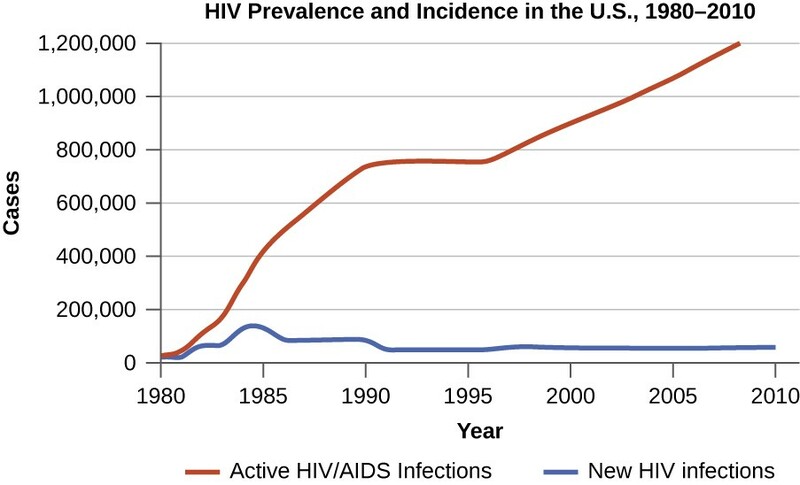 This graph compares the incidence of HIV (the number of new cases reported each year) with the prevalence (the total number of cases each year). Prevalence and incidence can also be expressed as a rate or proportion for a given population. There are two aspects of morbidity that are relevant to an epidemiologist: a disease’s prevalence and its incidence. Prevalence is the number, or proportion, of individuals with a particular illness in a given population at a point in time. For example, the Centers for Disease Control and Prevention (CDC) estimated that in 2012, there were about 1.2 million people 13 years and older with an active human immunodeficiency virus (HIV) infection. Expressed as a proportion, or rate, this is a prevalence of 467 infected persons per 100,000 in the population. On the other hand, incidence is the number or proportion of new cases in a period of time. For the same year and population, the CDC estimates that there were 43,165 newly diagnosed cases of HIV infection, which is an incidence of 13.7 new cases per 100,000 in the population. The relationship between incidence and prevalence can be seen in Figure 1. For a chronic disease like HIV infection, prevalence will generally be higher than incidence because it represents the cumulative number of new cases over many years minus the number of cases that are no longer active (e.g., because the patient died or was cured). In addition to morbidity rates, the incidence and prevalence of mortality (death) may also be reported. A mortality rate can be expressed as the percentage of the population that has died from a disease or as the number of deaths per 100,000 persons (or other suitable standard number). Explain the difference between incidence and prevalence. Describe how morbidity and mortality rates are expressed. Diseases that are seen only occasionally, and usually without geographic concentration, are called sporadic diseases. Examples of sporadic diseases include tetanus, rabies, and plague. In the United States, Clostridium tetani, the bacterium that causes tetanus, is ubiquitous in the soil environment, but incidences of infection occur only rarely and in scattered locations because most individuals are vaccinated, clean wounds appropriately, or are only rarely in a situation that would cause infection. Likewise in the United States there are a few scattered cases of plague each year, usually contracted from rodents in rural areas in the western states. Diseases that are constantly present (often at a low level) in a population within a particular geographic region are called endemic diseases. For example, malaria is endemic to some regions of Brazil, but is not endemic to the United States. Diseases for which a larger than expected number of cases occurs in a short time within a geographic region are called epidemic diseases. Influenza is a good example of a commonly epidemic disease. 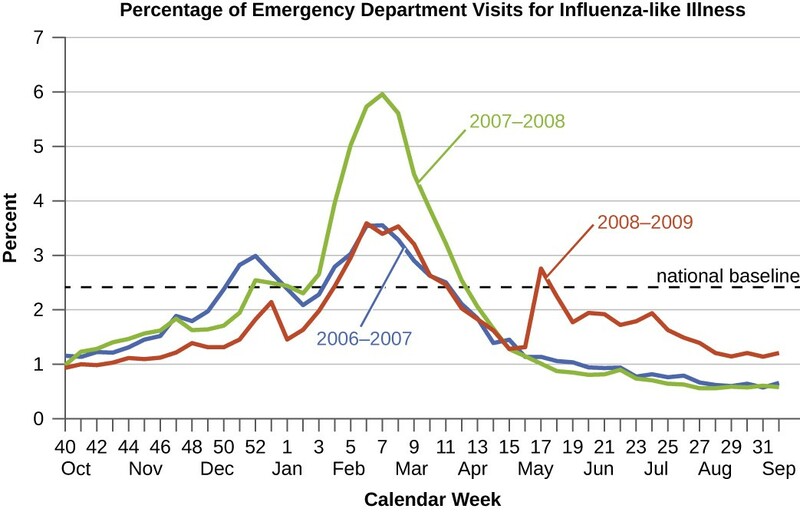 Incidence patterns of influenza tend to rise each winter in the northern hemisphere. 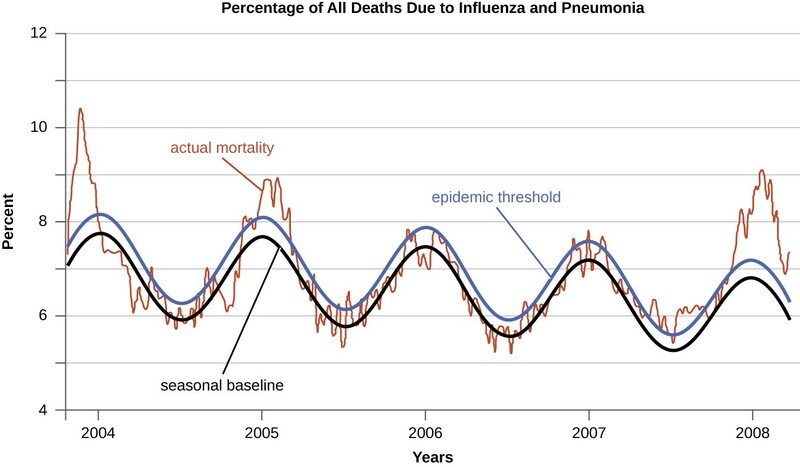 These seasonal increases are expected, so it would not be accurate to say that influenza is epidemic every winter; however, some winters have an usually large number of seasonal influenza cases in particular regions, and such situations would qualify as epidemics (Figure 2 and Figure 3). An epidemic disease signals the breakdown of an equilibrium in disease frequency, often resulting from some change in environmental conditions or in the population. In the case of influenza, the disruption can be due to antigenic shift or drift (see Virulence Factors of Bacterial and Viral Pathogens), which allows influenza virus strains to circumvent the acquired immunity of their human hosts. An epidemic that occurs on a worldwide scale is called a pandemic disease. For example, HIV/AIDS is a pandemic disease and novel influenza virus strains often become pandemic. Explain the difference between sporadic and endemic disease. Explain the difference between endemic and epidemic disease. This example continues the story that started above. Hospital physicians suspected that some type of food poisoning was to blame for the sudden post-Thanksgiving outbreak of gastroenteritis in western Florida. Over a two-week period, 254 cases were observed, but by the end of the first week of December, the epidemic ceased just as quickly as it had started. Suspecting a link between the cases based on the localized nature of the outbreak, hospitals handed over their medical records to the regional public health office for study. Laboratory testing of stool samples had indicated that the infections were caused by Salmonella bacteria. Patients ranged from children as young as three to seniors in their late eighties. Cases were nearly evenly split between males and females. Across the region, there had been three confirmed deaths in the outbreak, all due to severe dehydration. In each of the fatal cases, the patients had not sought medical care until their symptoms were severe; also, all of the deceased had preexisting medical conditions such as congestive heart failure, diabetes, or high blood pressure. After reviewing the medical records, epidemiologists with the public health office decided to conduct interviews with a randomly selected sample of patients. What conclusions, if any, can be drawn from the medical records? What would epidemiologists hope to learn by interviewing patients? What kinds of questions might they ask? When studying an epidemic, an epidemiologist’s first task is to determinate the cause of the disease, called the etiologic agent or causative agent. Connecting a disease to a specific pathogen can be challenging because of the extra effort typically required to demonstrate direct causation as opposed to a simple association. It is not enough to observe an association between a disease and a suspected pathogen; controlled experiments are needed to eliminate other possible causes. In addition, pathogens are typically difficult to detect when there is no immediate clue as to what is causing the outbreak. Signs and symptoms of disease are also commonly nonspecific, meaning that many different agents can give rise to the same set of signs and symptoms. This complicates diagnosis even when a causative agent is familiar to scientists. Robert Koch was the first scientist to specifically demonstrate the causative agent of a disease (anthrax) in the late 1800s. Koch developed four criteria, now known as Koch’s postulates, which had to be met in order to positively link a disease with a pathogenic microbe. Without Koch’s postulates, the Golden Age of Microbiology would not have occurred. Between 1876 and 1905, many common diseases were linked with their etiologic agents, including cholera, diphtheria, gonorrhea, meningitis, plague, syphilis, tetanus, and tuberculosis. Today, we use the molecular Koch’s postulates, a variation of Koch’s original postulates that can be used to establish a link between the disease state and virulence traits unique to a pathogenic strain of a microbe. Koch’s original postulates and molecular Koch’s postulates were described in more detail in How Pathogens Cause Disease. List some challenges to determining the causative agent of a disease outbreak. The main national public health agency in the United States is the Centers for Disease Control and Prevention (CDC), an agency of the Department of Health and Human Services. The CDC is charged with protecting the public from disease and injury. One way that the CDC carries out this mission is by overseeing the National Notifiable Disease Surveillance System (NNDSS) in cooperation with regional, state, and territorial public health departments. The NNDSS monitors diseases considered to be of public health importance on a national scale. Such diseases are called notifiable diseases or reportable diseases because all cases must be reported to the CDC. A physician treating a patient with a notifiable disease is legally required to submit a report on the case. Notifiable diseases include HIV infection, measles, West Nile virus infections, and many others. Some states have their own lists of notifiable diseases that include diseases beyond those on the CDC’s list. Notifiable diseases are tracked by epidemiological studies and the data is used to inform health-care providers and the public about possible risks. The CDC publishes the Morbidity and Mortality Weekly Report (MMWR), which provides physicians and health-care workers with updates on public health issues and the latest data pertaining to notifiable diseases. Table 1 is an example of the kind of data contained in the MMWR. The current Morbidity and Mortality Weekly Report is available online. Describe how health agencies obtain data about the incidence of diseases of public health importance. Epidemiology is the science underlying public health. Morbidity means being in a state of illness, whereas mortality refers to death; both morbidity rates and mortality rates are of interest to epidemiologists. Incidence is the number of new cases (morbidity or mortality), usually expressed as a proportion, during a specified time period; prevalence is the total number affected in the population, again usually expressed as a proportion. Sporadic diseases only occur rarely and largely without a geographic focus. Endemic diseases occur at a constant (and often low) level within a population. Epidemic diseases and pandemic diseases occur when an outbreak occurs on a significantly larger than expected level, either locally or globally, respectively. Koch’s postulates specify the procedure for confirming a particular pathogen as the etiologic agent of a particular disease. Koch’s postulates have limitations in application if the microbe cannot be isolated and cultured or if there is no animal host for the microbe. In this case, molecular Koch’s postulates would be utilized. In the United States, the Centers for Disease Control and Prevention monitors notifiable diseases and publishes weekly updates in the Morbidity and Mortality Weekly Report. Match each term with its description. (D) Sporadic disease is a disease found occasionally in a region with cases occurring mainly in isolation from each other. (E) Endemic disease is a disease found regularly in a region. (B) Pandemic disease is a disease in higher than expected numbers around the world. (A) Morbidity rate is the number of disease cases per 100,000 individuals. (C) Mortality rate is the number of deaths from a disease for every 10,000 individuals. The ________ collects data and conducts epidemiologic studies in the United States. The CDC (Centers for Disease Control and Prevention) collects data and conducts epidemiologic studies in the United States. During an epidemic, why might the prevalence of a disease at a particular time not be equal to the sum of the incidences of the disease? In what publication would you find data on emerging/reemerging diseases in the United States? Why might an epidemiological population in a state not be the same size as the number of people in a state? Use an example.